In December of 1917, Grace Shipley opened her art book of 10×12” drawing paper and sharpened her pencil with a pocket knife. She took out a special gum eraser she kept in the pencil box because when she corrected mistakes she didn’t want smudges. Grace had learned of a Cream of Wheat contest for art entries that would inspire frugal good eating during WWI. According to her sister Myrtle, all their brown paper sacks become practice scraps as Grace sketched one idea after another, smiling and humming as she put pencil to paper before breakfast, in between chores, and until she went to bed at night. She titled her picture “Preparedness,” and it was one of the winners. The prize was a year’s supply of Cream of Wheat, though no one remembers now exactly how many boxes that was. 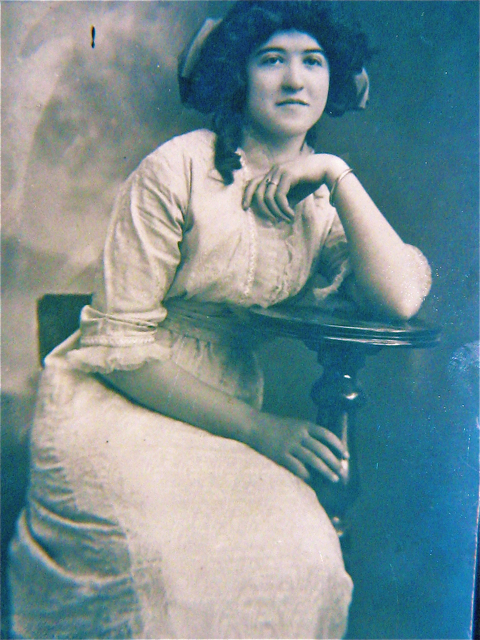 Grace was featured in the local newspaper, followed by congratulation notes from friends and strangers, and she was a guest at a women’s art luncheon. As the story goes, she used the back of her program to doodle a drawing of the speaker’s fancy hat. What is it about putting pencil to paper, crayons to coloring books, or chalk to sidewalks that helps us hum, smile, and live outside ourselves? I never knew my grandmother, Grace Shipley Shepherd, who died of meningitis when my father was very young, but I know from others—and I’ve often felt it myself—that putting pencil to paper, to draw or to write, is a gift for and from the heart. Enjoy this activity. Shake your head and loosen the cobwebs. Use a crayon or a marker if it will make you feel more like a playful child. And it’s okay if you smile and hum as you draw. 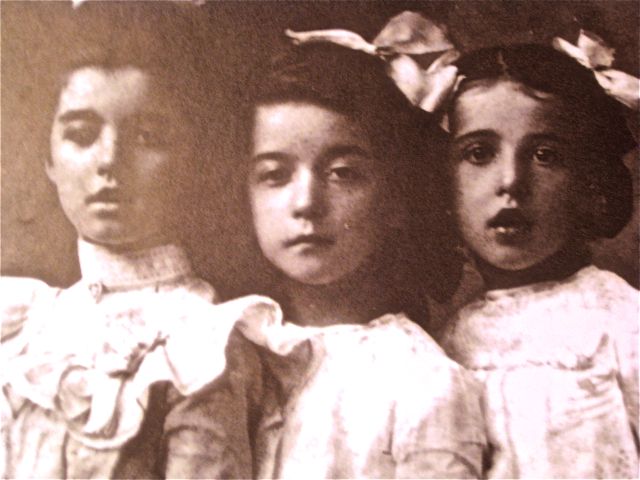 Grace (right, age 6) with her sisters. 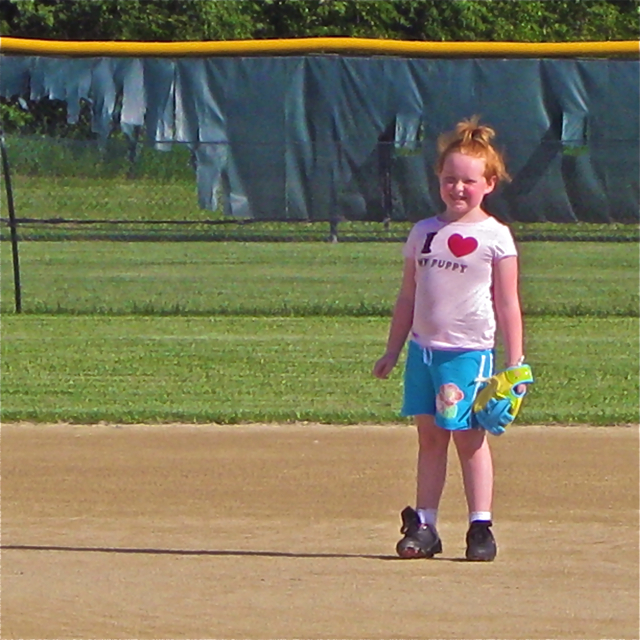 Grace’s great-great-granddaughter, Grace Elizabeth, age 6, learning to play softball. But she loves to draw, too. I am smiling…I love cream of wheat! The drawing is wonderful. Your grand-daughter is precious…that red hair! I bet she is full of personality and as sweet as she is cute! Have a fabulous weekend! Our family ate a lot of Cream of Wheat when I was growing up, Robyn, and it was my favorite winter breakfast. My mom always made extra for our outside dogs, to add to their dog food and get them started on cold mornings. I was thrilled when my grandmother Grace’s drawing was matted and framed and given to me and I learned the story. Little by little I learned of her kindness, creativity and love for her little boy (my dad). It’s like writing from a prompt, Nancy. It’s better to suspend expectations on the outcome. 😉 But it really does increase focus and concentration. 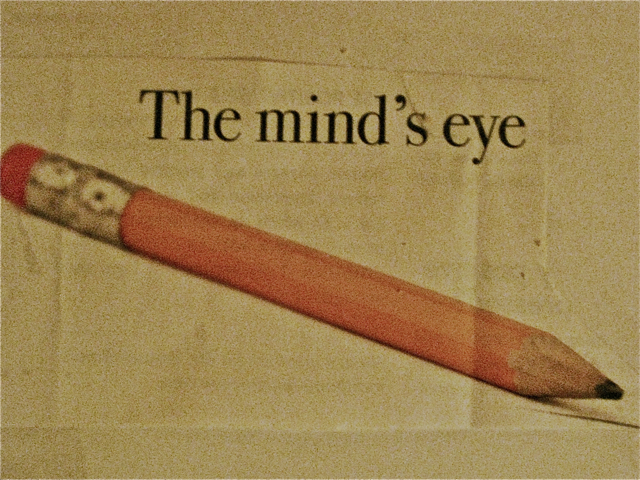 Creativity and a wooden pencil…when life was simpler!!! Thanks for the reminder. My paternal grandfather told me that Grace went to the library and read through all kinds of newspapers and magazines to find numerous contests for artists. Because of the time period, 1917-1923, many of the prizes were practical foods, gas coupons and book choices. To win one–like the year’s supply of Cream of Wheat–was a big deal! Thanks, Maureen. I’m glad you enjoyed it. What a wonderful drawing. I did a similar exercise like this in my clay class . It was fun . I will try doing it with the pencil . Have a great Memorial Day . You have a great Memorial Day, too. What a great story, Marylin. A year supply of Cream of Wheat was like hitting the jackpot in those days. I’ve gotten quite hooked on the adult coloring books lately. Like working a jigsaw puzzle, it keeps me still. And that was almost seven years ago, Jill. She’ll be 13 in August, and she’s playing basketball and doing archery now…and she’ll probably be as tall as I am in another year! But I love that picture of her playing softball at the same age her great-great-grandmother Grace was dressed in lacy white dresses and big white hair bows! I love mandala coloring pages. Like you, I find it keeps me still…and calm. Oh how true and how wonderful, Marylin! What a family you have! Each year I’m delighted to learn something new about my grandmother Grace or even my mom, and how they’re reflected in the lives of my daughter Molly and my granddaughter Grace. It’s one of those wonderful surprises, Julia. I love your stories about your great grandmother, Grace. I like that her name has been passed on to another generation. My grandmother’s name was Lydia, and I have a cousin and a second cousin named Lydia. The amazing thing is my cousin Lydia is so much like my dear grandmother it is incredible. Of the 32 grandchildren, she was the perfect one to get her name! Darlene, I really do think that sometimes special names, like your grandmother’s and mine, when they’re given to the grand- and great-granddaughters, they often carry special connections and characteristics. Your cousin and my granddaughter seem to have inherited special qualities. I had a Jewish friend who once told me that in her family, the name couldn’t be given to a baby until the bearer of the name had died because then the previous qualities were freed to be passed on. Now that is very interesting. My cousin was three when our Grandmother passed away. I think my grandmother was very pleased one of her grandchildren had her name. I do believe these special qualities are passed on to the right person, although we all have a bit of grandma in us!! Wonderful post, Marylin! How cool that you have your grandmother’s drawing, and the story to go with it. I will have to try that drawing exercise. Your granddaughter Grace looks like her great great grandmother–at least at that age. It’s one of those gifts I really do cherish, Merril. 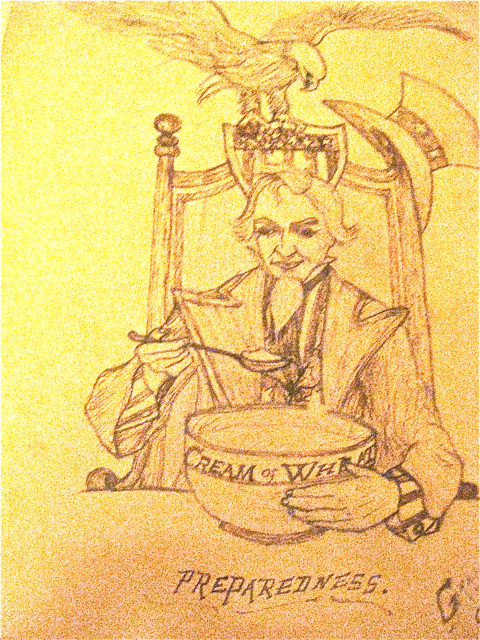 I passed the little girl portrait of my grandmother Grace to my granddaughter Grace for her birthday, but I’ll keep the framed and matted winning pencil drawing of Uncle Sam eating Cream of Wheat. The drawing makes me smile and also inspires me to enter writing contests and submit my writing. Hi Marylin, I worked with another event planner recently and she used a pencil to write all of her notes. I immediately saw the value in that and now carry a pencil with me when I meet my brides. I love a good sharp pencil! Thank you for your interesting story and I will definitely try the exercise! Joanne, one year at a writing conference the keynote speaker, Paul Gillette, said that he loved the speed and spellchecks, etc., of his laptop, but for creativity and really “connecting” with his words, nothing beat the scratch of a #2 pencil for writing. And I have to admit that when I feel sluggish about a writing project, nothing works better than to take a little pad of paper and a pencil (with an eraser) and sit at the library or in a coffee shop or even a quiet room at home, and write in longhand. Well, that was fun! On the few occasions I use a pencil, I keep a sharpener near by – I feel more efficient with a sharp point! I imagine Memorial Day has special meaning for you, Marylin – hope you enjoy the holiday! Yesterday our daughter and grandchildren went with me to put flowers on my dad’s grave, and we each also put an extra flower on the very old graves (before 1899) that hadn’t been given any attention. It was sweet to watch the serious and thoughtful ways the grandchildren selected the old markers that needed flowers. What a lovely thing to see and participate in! It was very special, Shel. Especially watching the way each child looked for “just the right” gravestone from the 1800s, abandoned and needing flowers at Memorial Day. I think my dad would have been touched by the sweet gestures of his great-grandchildren. Wow, what an inspiring story. This post sure resonated with me, Marylin. Thanks, Tracy. After I posted it, I couldn’t stop thinking about my grandmother, Grace, and how I never knew her (and my dad lost her when he was so young), and how she so patiently and lovingly “created her art,” up until she died of meningitis. She had so many plans and so many art projects started, and suddenly she was gone. Have you thought about adding a Google+ share button, Marylin? Tracy, what is a Google+ share button? More information, please! Welcome, Jimmy. I’m glad your stopped by, and hope you’ll continue to visit my blog. Ahh, the powerful pencil (or pen!) goes way back and is on both sides of your family, I see. It seems to be such a normal and healthy part of your life, like breathing, almost! I’ll have to try the exercise. May granddaughter Grace and I did mindfulness coloring pages one evening. We began reluctantly, but by the time we both finished, we were totally submerged in our projects and had a great time. Memorial Day this year we were with my mom, and Molly, Grace, Gannon and I also put flowers on my dad’s headstone, and the kids left pennies on the top of the headstone to show they were there. Marylin, what a clever way to introduce your grandmother. I love to draw too, and so I understand all the smiling and humming that accompany an image as it takes shape on the page. I also love the way you end your story with great-great granddaughter Elizabeth. How sad that you never knew your grandmother and that meningitis took her away from your family. She would have been mesmerizing to a child. Even just the stories about her have always been mesmerizing, Shirley. Everyone who knew her–from her sisters and all the family to friends and neighbors–my Grandmother Grace was kind, sweet, funny, loving, and very creative…and she had her own style of sketching, drawing and even just doodling on scrap paper. My dad was so young when she died, and it meningitis is a hard, painful way to die, so as I was growing up and wanted to learn about her and asked questions, he always leaned in to listen to the stories, too.